I bought these cucumbers - they can be a little larger than the dill-pickle size. 2. Rinse cucumbers and dock ends. 3. 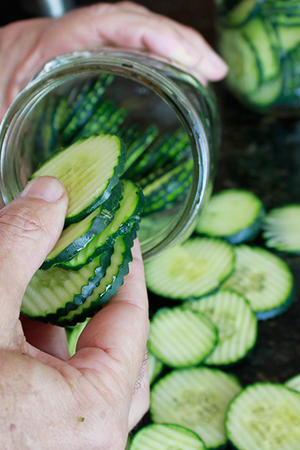 Cut cucumbers into 1/8" slices - ideally using a mandolin slicer for "crinkle cut" effect. The advantage of the mandolin tool are the crinkles, which help the pickling juices surround the cucumber slices and prevents them sticking together. 4. Mix vinegar, salt, sugar, turmeric and mustard seeds in a medium saucepan and heat. Bring to boil, stirring occasionally. 5. 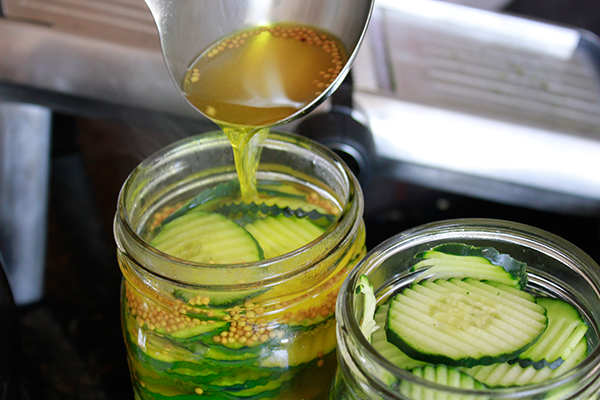 Tightly pack cucumber slices into clean jars. 6. Pour over hot liquid and seal. Wipe clean outside of jars. 7. Best if stored in fridge. 1. Add the pickles in two tranches - let the first packing steep in the boiling liquid for a minute or so and soften, then top up with more cucumbers. 2. You can buy "pickling spices" to add from the store. Or make you own with coriander seeds, dill seeds, yellow mustard seeds, chili flakes, bay leaf, cloves, pepper corns - and things like that.